An astronomer is a guy who stands around looking at heavenly bodies. Quoted in M. Goran, A Treasury of Science Jokes (1986), 29. I’m always for a better sky. From 'The Objection to Being Stepped On', collected in Edward Connery Latham (ed. ), The Poetry of Robert Frost (1971), 451. 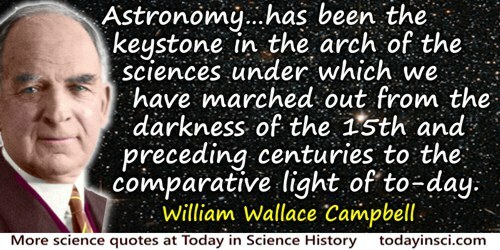 Astronomers work always with the past; because light takes time to move from one place to another, they see things as they were, not as they are. The Telescope Handbook and Star Atlas (1967), 33. The astronomers must be very clever to have found out the narnes of all the stars. In The Physics Teacher, October 1970. 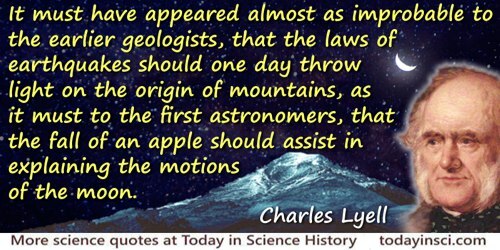 The astronomers with all their hypotheses give us no satisfying or abiding conception of the Universe. We are left as bewildered as ever. In 'Tea', The Doctor’s Notebook (1937), 224. Usually, only handfuls of dedicated amateur astronomers view such events. Billions of people saw Hale-Bopp. So, until a better comet comes along, it remains the great comet of our lives. In 'Hale-Bopp + 10', Astronomy (Jul 2005), 33, No. 7, 76. …by shortening the labours doubled the life of the astronomer. On the benefit of Napier’s logarithms.